KPMG and CB Insights' Q3 2016 fintech report highlights the latest trends in venture-backed fintech companies globally. 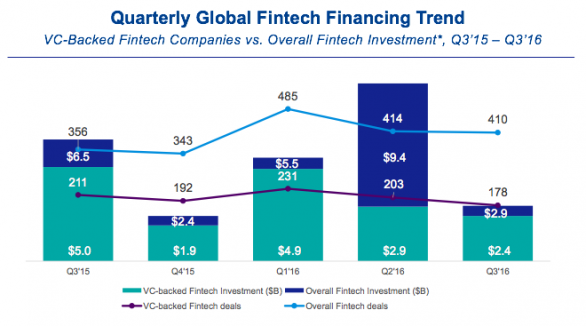 For the second straight quarter, U.S. venture capital (VC) investment in fintech companies declined in Q3'16. 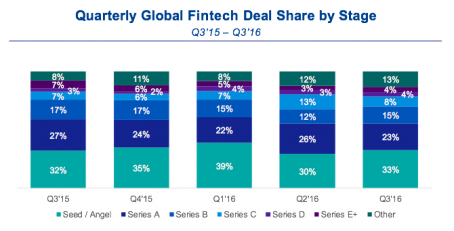 According to the Pulse of Fintech, the quarterly global report on fintech VC trends published jointly by KPMG International and CB Insights, U.S. fintech startups saw funding total $800M in Q3'16, a decrease of 50% from Q2'16, while deal activity experienced a 5-quarter low with 88 deals recorded. Get the free 92-page report for all the latest fintech financing trends globally. 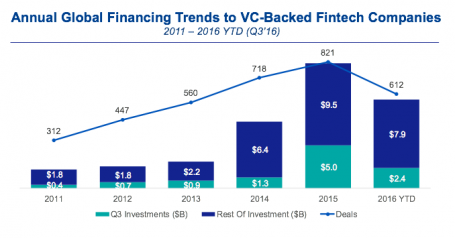 VC-backed fintech companies raised $2.4B in Q3’16, representing a 52% funding drop when compared to Q3’15. 2016 deal activity is projected to slightly drop year-over-year, at the current run-rate. Fintech seed deal share rose slightly in Q3’16 to hit 33% from 30% in Q2’16 as early-stage activity (Seed/Series A) remained at 56% on a quarterly basis. Series C deal share dropped from 13% in Q2’16 to 8% in Q3’16. 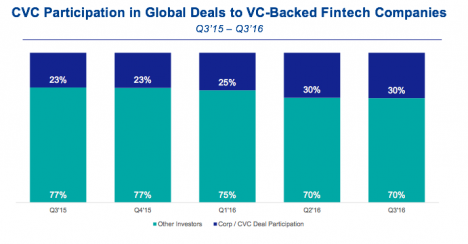 Corporate participation in global VC-backed fintech deals hit 30% for the second consecutive quarter. Asia saw $50M+ fintech rounds stay level for the fourth straight quarter, while Europe has not registered a $50M+ round to a VC-backed fintech company in 2016 to-date. 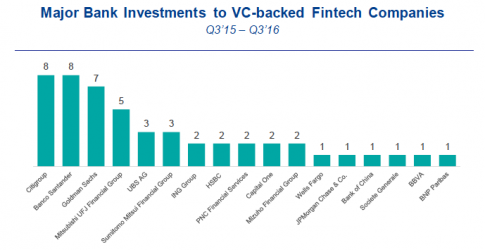 Over the past 5 quarters, Goldman Sachs, Citigroup and Banco Santander or their corporate venture units have each completed seven or more deals to VC-backed fintech companies.